A quick and easy way to calculate the fixed costs & interest your company can apply to unpaid invoices under the "Late Payment of Commercial Debts (Regulations) 2013". The app is completely free to use and download and requires no in-app purchases or registration. Similarly we don't include third party advertisements or endorsements. Calculate the interest and fixed costs at a stroke. 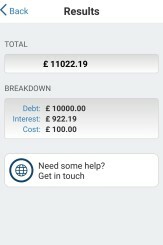 Just enter the date the invoice went overdue and amount outstanding and let our free app give you a complete breakdown of the charges. We know that any data, but particularly financial data, is always a sensitive subject. With our app you are completely secure. It holds no logs and requires no special permissions. 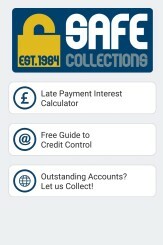 The Late Payment calculator app is a free download for Android and iPhone users provided by Safe Collections, a leading UK & International debt collection and credit control company. The late payment app is provided free of charge to all businesses as part of our effort to encourage prompt payment by UK companies. The Late Payment calculator features a simple, user friendly interface that makes calculating the costs and interest a breeze. Enter the invoice value, day it became overdue and voilà, our free app gives you a complete breakdown of both the fixed costs and interest payable on any unpaid invoice. We know that financial data is some of the most precious in any business, that is why we designed the Late Payment iCalc to be completely secure from the ground up. No names or registration need be provided and no data is retained. 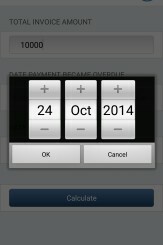 The Safe Collections Late Payment iCalc is free to download on all major mobile operating systems. Simply search for “Late Payment” on your device store or use the links below to go direct. Looking for help with Debt Collection? Copyright 2014. Safe Collections. All Rights Reserved. 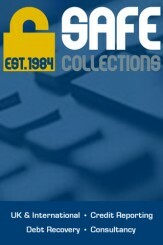 Safe Collections is a trading style of Safe Collections Ltd. Registered Office: Centurion House, Centurion Way, Leyland, Lancashire. PR25 3GR Registered in England Company Number 1815264.